Noni. Foul smelling and bitter tasting fruit that commonly grows on small trees close to the sea. The fruit is initially green, but turns white or pale yellow upon ripening. I had noni once as juice. First taste was shock.. It smell so bad like goat cheese. Then I just drank it because it's healthy. My neighbor told me to use Noni leaves for salad greens and that they were very good for you . I tried it but they have no flavor at all. 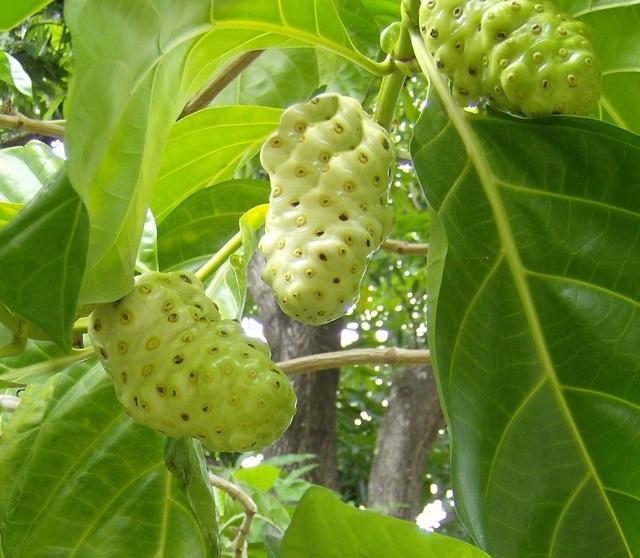 In St. Maarten some people call it Noni and others call it Hog Fruit. i just eat the flowers to avoid the unpleasant fruit. Why's it called duppy soursop. does it come in like duppy? This fruit is one of the natural medicines that's used widely in Jamaica and the caribbean. It's an elixir that purges the blood. Come to the Caribbean and experience some of the amazing healing power of herbs.